Wow! 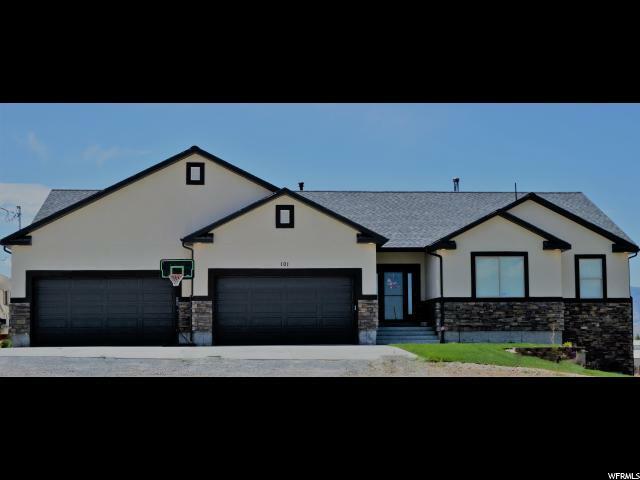 This Secluded custom built gorgeous Rambler has it all including a Mechanics Dream garage. 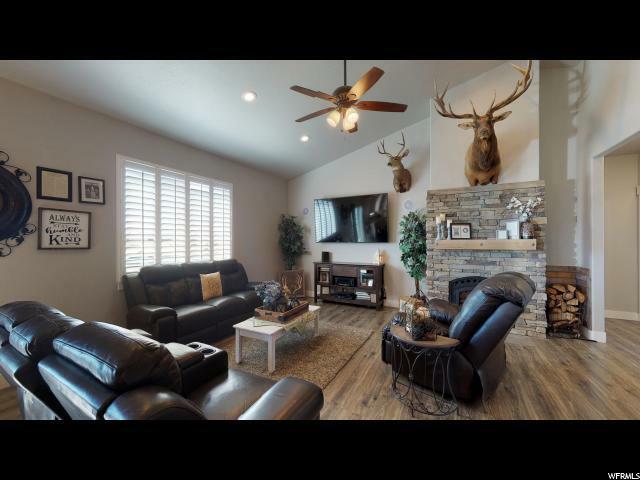 This 5 bedroom 4 bath is nestled perfectly in between the Sheeprock and Onaqui Mountains at the south end of Tooele County. This home has lots of upgrades throughout and the views are captivating. 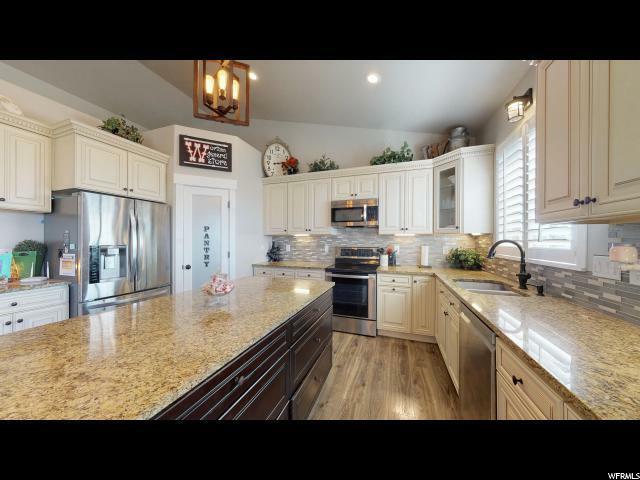 The Kitchen features Venetian granite counter tops, plenty of spacious cabinets, new stainless steel LG appliances, a Large Island with extra deep drawers, custom lighting and a Pantry fit for a king! This home has upgraded laminate wood flooring in the open area kitchen and family room. The Great room has surround sound speakers, vaulted ceiling, wood burning fireplace and big windows that have plantation shutters to enjoy the awesome views of Harker Canyon and the mountains near the Vernon Reservoir. A full bath with tile tub surrounds and a bedroom with a smaller walkin closet and a laundry room are on this level. The Master Suite has a separate tub and shower, granite counters and glass bowl above counter sinks and the biggest walk in closet complete with built in shelves. There is a mud room with built in bench and shelves just as you are headed out to THE BEST Garage in town! 6 car garage has epoxy floors, custom cabinets with granite counter workbench and a 9000 pound hydrolic car lift!! Moving down to the lower level of this beautiful home you'll find a large family room with HUGE picture windows to enjoy the sunset, a walkout, surround sound speakers built in and a King Pellet stove. A secured storage room to keep valuables locked away. 2 large bedrooms with spacious walk in closets and a 3/4 bath. A second Laundry Room with a big counter. This level also features a second Master suite with a big garden tub and walk in closets. There's storage everywhere here including a shipping container that can be included with the purchase. The builder spared no expense when building this home. Also has a 10x 16 trex deck with iron railing. Built on a 1 acre Horse Property Lot that is fenced and has full landscaping in the front and back yard, but for no additional cost includes a 2nd acre. Home also is heated by propane. A few minutes from the reservoir, the famous wonderstone pile and the elementary school. The town has its own post office, church and gas station and is only 40 minutes from the city. 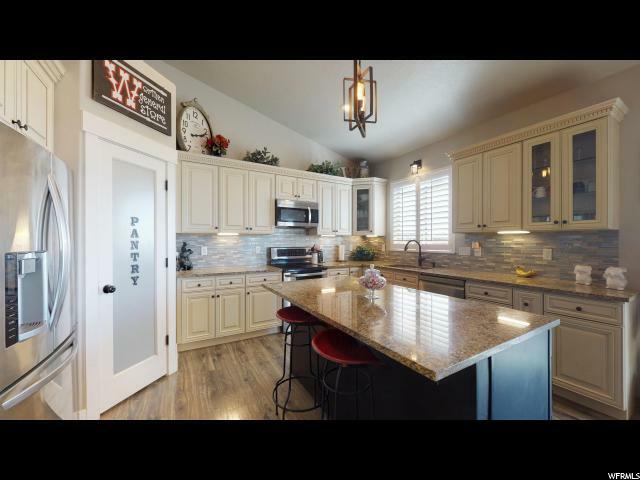 Dont forget to ask your realtor for the Drone footage and a 3D Virtual Reality tour or Come check out this home where you can still see the stars shining bright and country living at its finest. YOU CANT BUILD FOR THIS PRICE! Square footage figures are provided as a courtesy estimate only and were obtained from County records . Buyer is advised to obtain an independent measurement.